You are here: Home / Dental Surveys / Dentist Survey: Do You Own or Rent Your Dental Practice Real Estate? Dentist Survey: Do You Own or Rent Your Dental Practice Real Estate? This survey by The Wealthy Dentist asked about a major dental practice management expense. Do dentists lease or own their dental real estate? More than three-quarters of the dentists surveyed own their practice facilities. Despite unstable real estate values across the U.S. within the past 10 years, dentists still prefer to own rather than rent. Only 3% of the respondents own and are worried about their mortgage. 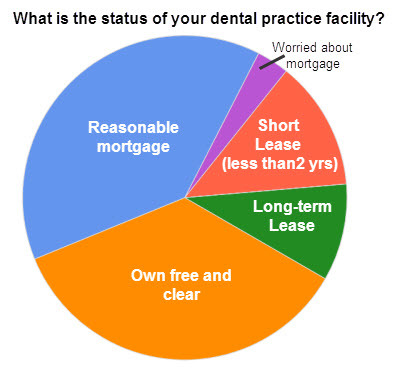 The majority of dentists either own the building free and clear ( 35% ), or own it and pay a reasonable mortgage (39% ). Fewer than one quarter of our dentists rent their facilities, with 10% on a long term lease, and 13% on a lease expiring in less than two years. Do you think it’s better to own or rent your dental practice real estate?